2018-2019 Season Tickets Now Available! For more information on season tickets, please email the FSW Athletics Department at BucsTix@fsw.edu or call the Suncoast Credit Union Arena Box Office at 239-481-4849. 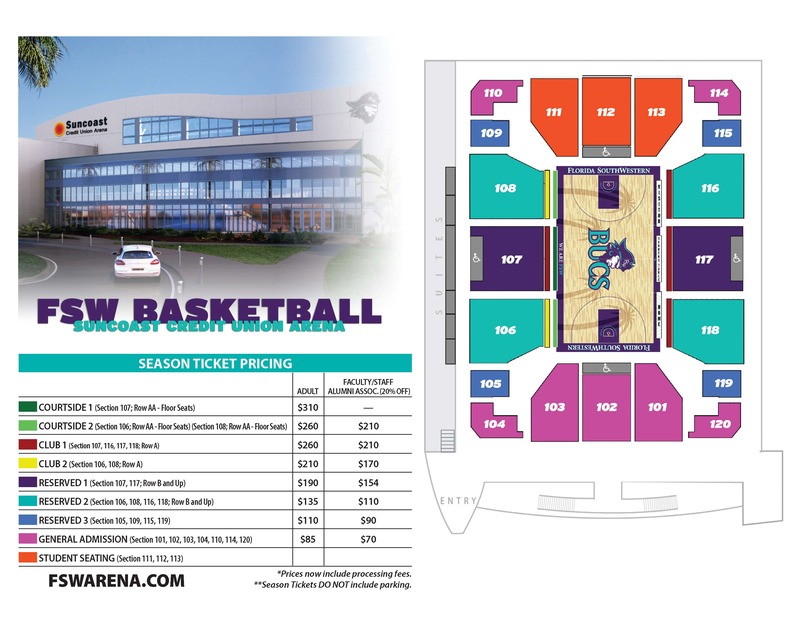 Purchase season tickets in person at the Suncoast Credit Union Arena Box Office or by mailing in the printed ORDER FORM to 13350 FSW Parkway (Attn: FSW Basketball Season Tickets), Fort Myers, Florida 33919. Season ticket holders can also fax their completed ORDER FORM to (239) 489-0326 or email it to info@bbmannpah.com. Prices for season tickets remain the same as the last two seasons! Fans have several season ticket options (Men’s and Women’s combo) to choose from. *Prices now include processing fees. **Season Tickets DO NOT include parking. FSW faculty and staff receive a 20% discount off the price of season tickets with a valid FSW Buc Card (must purchase tickets in person to receive discount). FSW students will be admitted for FREE with a valid BUC Card. Buccaneer fans interested in becoming new season ticket holders can visit the Suncoast Credit Union Arena Box Office (Monday – Friday from 10 a.m. until 5 p.m.); the Barbara B. Mann Box Office (Monday – Friday from 10 a.m. until 5 p.m.); or call the ticket office at 239-481-4849.